"592.- New Iron R.R. Bridge, Portage, N.Y.-(side view.)" 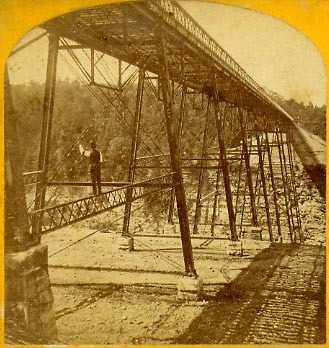 Although the intricate truss work of the old wooden Portage Bridge was destroyed in the fire of May 1875, visitors soon came to see the remarkable "spider" bridge that replaced it. This view is taken from the northeastern end of the bridge. This "new iron R.R. Bridge" still stands today.